The bright young students at the University of Washington’s medical school always spend their second year of studies in Seattle. The hubbub and opportunity offered in the Pacific Northwest’s largest city is exciting. Then their third year begins and some end up learning in Spokane’s hospitals and clinics. Some of them consider this a spell of bad luck. As the Inland Northwest grows, so does its prominence as a regional medical hub and its need for more health professionals. It’s also why, beginning next year, people like Khorsand may become scarce. That is, rather than transitory students spending just one or two years here, medical students will begin spending all four years in Spokane, thanks to the completion of the Riverpoint Campus that will house a complete four-year program in the University District. Of course, another reason Khorsand and his wife chose Spokane is so they could spend the year together. Otherwise, they would’ve been moved around — from Juneau to Billings to Pendleton — every six weeks. 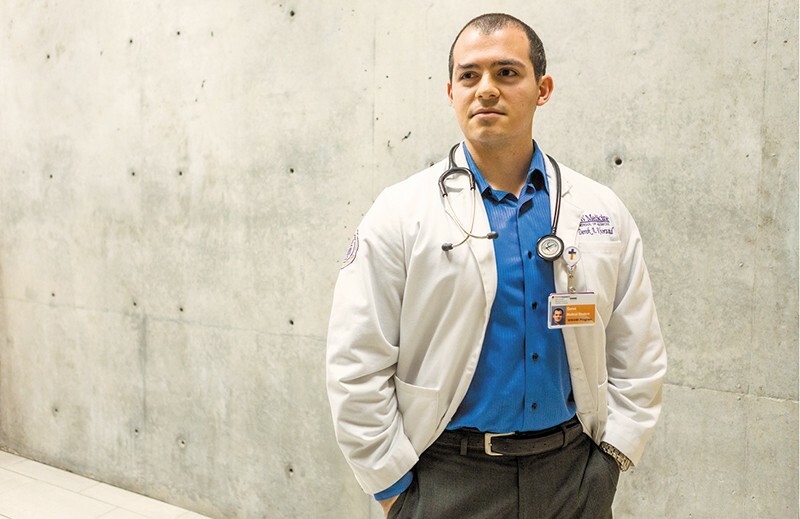 Medical school can be as hard as you imagine, Khorsand says. Some days, he rises at 3:30 in the morning and doesn’t get home from the hospital till 7 that evening. And that’s when the studying begins because, yes, there are still tests. For Khorsand, living a life outside of his studies is important. He and his wife sneak in a date night on a regular basis. With the workload and stress, Khorsand couldn’t be blamed for allowing his body to slide into disuse. But he still hits the gym. “You see reasons why you should live to the fullest,” he says of his work at the hospital. Khorsand decided he was going into medicine in middle school. His mom’s an operating room nurse. His older sister’s a first-year anesthesia student at UW. He and his wife met in honors calculus on Khorsand’s first day of college at the University of Washington, where he would eventually get his undergrad degree in biochemistry. The two got engaged two months after beginning medical school and were married last March. It’s been a life, for the most part, of reasoned, dispassionate decision-making. Khorsand knows exactly what he wants to do. Sort of. There is one moment during his time in Spokane, however, that has stuck with him like no other. It’s a moment that shows how close these students are to actually being doctors — even if the “real” doctor was right over his shoulder. He says it’s an opportunity he might not have gotten in Seattle, where students are competing with residents and fellows to have the opportunity to deliver a baby. Khorsand still has a few years to go before practicing on his own, and he has no idea where he and his wife will land. But you never know. Maybe he’ll treat the baby he delivered as she grows from child to adult.